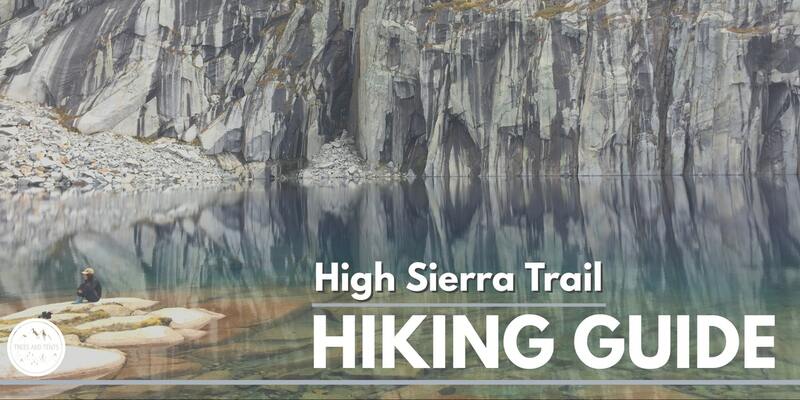 In September 2018 I hiked the High Sierra Trail, a 72-mile trail that runs from the Crescent Meadows trailhead in Sequoia National Park to Whitney Portal. It was my first long-distance trek since hiking part of the John Muir Trail in 2017. After hiking the JMT I was itching to spend more time in the Sierras and I jumped at the opportunity to hike the HST when a woman posted on a Facebook hiking group. A bunch of other women also jumped at the chance to hike the trail and before I knew it I was part of a group of 15 strangers who committed to hike the trail together. During the six months of planning most of the women in the group dropped out, so when the day came to meet everyone in Lone Pine there were only three of us left standing! Even though I had watched a few YouTube videos before I set off on the hike, I was shocked by how many beautiful spots are on this trail! (Check out the day-by-day trail guides below for more details about my favorite spots on the trail.) While dispersed camping is allowed, most of the scenic spots have established campsites with bear boxes. While we hiked the trail in seven days the abundance of camps with bear boxes makes it easy to take your time and meander– which makes this a great long-distance trail for newer backpackers. 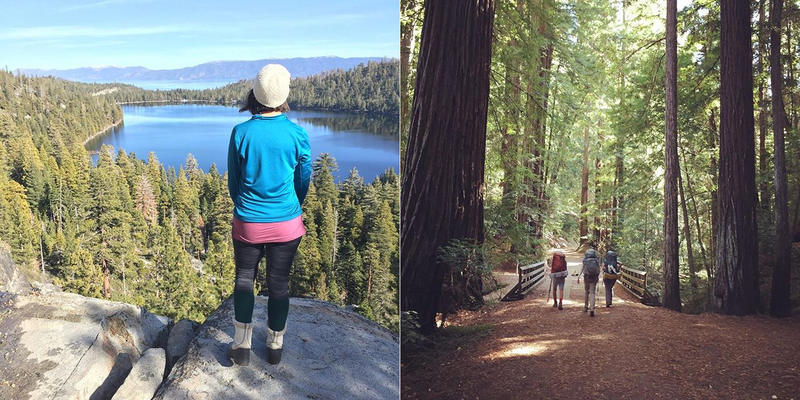 The trail takes you from one side of the Sierras to the other! Starting on the West side of the Sierras you will pass by Bearpaw High Sierra Camp before starting your climb over the first big peaks. On your ascent you'll be treated to several glacial lakes before crossing the magical Great Western Divide and dropping into a river valley. In the valley you'll get a brief respite from the elevation and climbing and you can soak your weary muscles in the hot spring. Your time in the valley is short lived and soon you'll find yourself ascending the Eastern side of the Sierras. 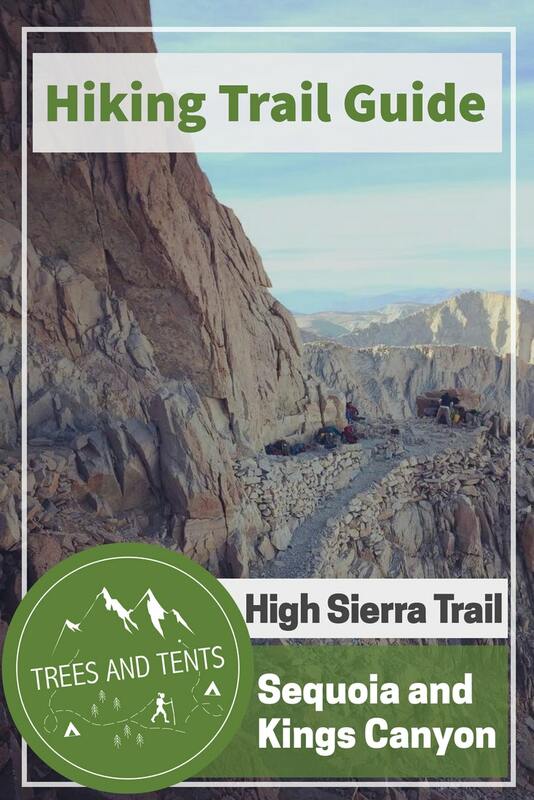 You'll continue climbing until you summit Mount Whitney, the tallest point in the lower 48! We hiked this in 7-days, but the availability of bear boxes at almost every camp make it easy to take your time and spend more time on the trail. 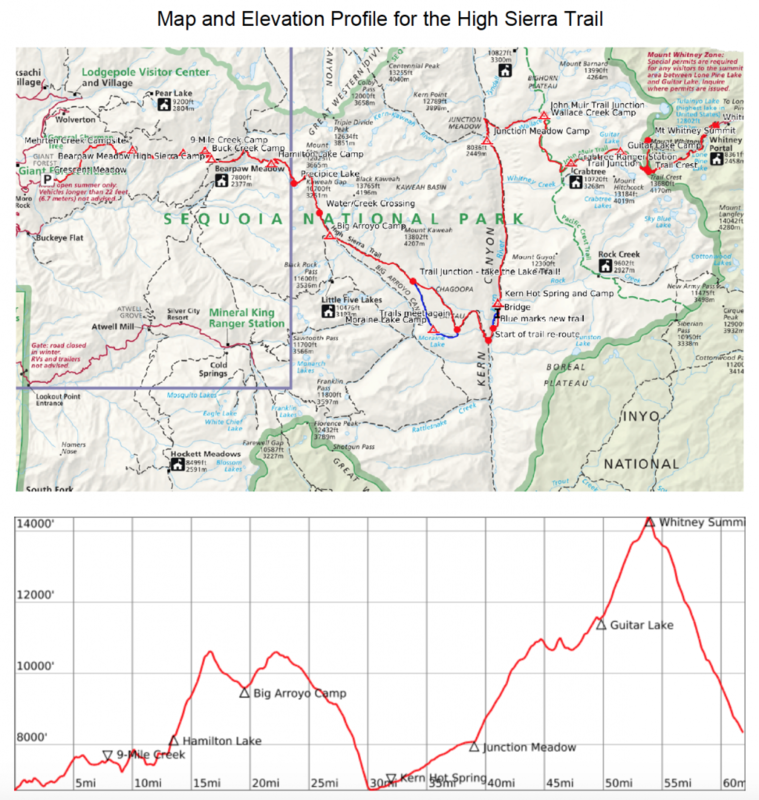 My suggested itinerary for a 7-day hike is at the end of this post. In June there may still be some snow on the trail in the higher elevations. In July you’ll have to deal with mosquitos, but there will probably be some beautiful wildflowers. Come August and September you’ll have less mosquitos, but the exposed sections of the trail will be very hot. If you hike in October you’ll have the trail all to yourself and you will be able to see the magnificent Fall colors. However, beginning in late-September there is a chance of early season snowstorms and all of the backcountry rangers have closed up shop for the season. Unless you are an experienced hiker and are prepared for possible inclement weather I don’t recommend starting your hike after October 15th. This is a popular trail and getting a permit can be a challenge. Permit quotas are in effect from May 21st-September 24th. During this time the park only allows 30 hikers to start the hike each day. The park sets aside 10 permits each day for walk-ups, and the other 20 permits are available for advance reservation. In 2019 you can start submitting permit requests at 12:01am on March 1st. To apply for a permit you’ll want to download the Wilderness Permit Application and fill out all of the relevant details (number of people in your group, trails, and entry and exit dates). Email your permit request on March 1st (for the best chance to snag a permit) or at least 2 weeks before you want to start hiking. The permit costs $10 plus an additional $5 for each person. If you are hiking outside of the quota season you can self-register for a permit without applying online. Check out the Sequoia and Kings Canyon Wilderness Trip Planner for more details about permitting and park restrictions. Arranging transportation to and from the trail is probably the most challenging part of the planning process. You’ll be walking from one side of the Sierra mountains to the other: Crescent Meadows (Sequoia National Park, west side of the Sierras) to Whitney Portal (east side of the Sierras). It is a 5.5 hour drive from your start point at Crescent Meadow to your end point at Whitney Portal. The easiest way to get to and from the trail is to enlist a friend or family member who is extremely nice (or owes you a big favor) to drop you off and pick you up. Unfortunately, none of my friends volunteered to make the 8+ hour trek from the Bay Area to chauffeur me to and from the trailhead. So, we put together a list of other options to get us there. 1. One-way car rental: This is possibly the most expensive option and it only works if you have multiple drivers. Since we were coming from the Bay Area we would either rent a second car near home or drive to Sacramento and rent a second car there. From Sacramento we would drive to Lone Pine and stash the non-rental car at a long-term parking area ($25 per week at the Lone Pine Chamber of Commerce) or at the Whitney Portal parking lot. Then, we would drive the rental car to Visalia and turn it in. From Visalia you can then take the Sequoia Shuttle into the park. Once you’re in the park you can take the park’s internal shuttle to pick-up your permit and get to the trailhead. At the end of the hike you will grab your car from Whitney Portal or hitch from the portal into Lone Pine to claim your car. 2. Take Public Transportation. This is the most affordable, but also the most time consuming option. Public transportation in the area is seasonal, and the routes and times often change. Since we were outside of peak tourist season we didn’t have many public transportation options available to us. But in peak months you can take the Eastern Sierra Transit and connect with other bus lines. Check out all of the available public transit options here. 3. Hire a private shuttle service. This is the option we ended up going with. It cost about $80 per person, but it was totally worth it. We ended up hiring a shuttle through East Side Sierra Shuttle and they were great. Like all outdoor pursuits, hiking can be dangerous. It is up to you to assess your fitness level and education yourself about any potential dangers. While I try to regularly update these hiking guides, you should always research trail conditions before heading out.If you want to know what I carry in my pack during backpacking trips check out my blog post with a packing list for beginner backpackers. My parents love to hike, and their next vacation is in the redwoods. I wonder if this is where they are headed. I’m going to share this and ask! This sounds like an amazing experience. Definitely something my husband and I would consider doing. Thanks so much for all the tips and information. Your planning skills are AWESOME! Sounds like a ton of fun!